One of the first questions would-be investors ask when they contact our sales team for pre-sales assistance before investing in physical gold for investment is ‘once I purchase gold, where should I store my bars/coins?’. One of the primary reasons people give for buying physical gold bars and coins is a desire to take their financial future into their own hands and remove the uncertainty of third parties such as banks who, in recent years have proven not to be quite the pillars of the economy we were led to believe. There are various options when it comes to keeping physical gold bullion bars and coins safe and secure which are primarily dictated by the size and type of investment. Your chosen storage solution will need to be suitably sized to comfortably house your investment, but also important is spare capacity to house any future expansion. Ensure you have enough space to house any additional investments you make in the years to come. As a rough guide, at maximum capacity, a 45 litre 81cm x 31cm x 18cm safe will hold approximately 10 kilograms of gold bullion bars. 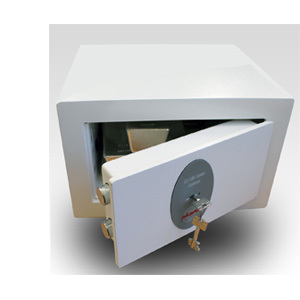 Most safes have a quoted cash rating to indicate the level of protection they offer. It is important to remember gold will be considered as cash and should be treated as such unless otherwise advised. Protecting your investment against theft is forefront in most investors’ minds but it’s also important to secure your investment against the unexpected. Most modern safes offer a level of protection against fire, water and airborne contamination. Look for a water-tight safe with a specified fire rating to ensure your investment is protected in any eventuality. The location of your safe in your home is a very important consideration. It is important to secure the safe to a solid structure and, where possible, hidden from view. There are many creative safe storage options available, wall safes, floor safes and safes hidden within book shelves and ordinary household goods and appliances. Larger investors may opt to secure their physical gold and silver bullion in a dedicated storage facility or bank vault. There are various ISO standards and accreditations that investors should look for when selecting a storage provider; the LBMA (London Bullion Market Association) provide a list of approved facilities and partners. For further advice regarding the purchase and storage of gold and silver bullion, please contact our sales and customer service team on 0121 523 1047.